Anjuna Beach is one the most popular beaches of Goa which is situated 8 kilometers west of Mapusa and 18 kilometers from the capital city, Panaji. The village of Anjuna is located in north Goa, and is a small area, which is nestled between the Arabian Sea and a small hillock. It overlooks the sea and thus gives a splendid look of the shoreline. The Anjuna Beach is known for its soft white sands and shoreline dotted with exotic palm trees. Its natural beauty attracts thousands of tourists from all over the world. Since the Anjuna beach has a rocky promontory, the ocean currents are not very strong and it offers the perfect locale for bathing and playing in the water. Tourists look forward to enjoying the water along with getting tanned in the sun. Sun bathing is a very popular activity on the beach. Anjuna is famous for its flea market which one can find towards the north where small cafes, bars and ethnic Indian handicrafts stalls are lined. One can find just about everything here. The electric items that are kept on sale here are particularly famed. The flea market is held on Wednesdays every week and if you are talented at bargaining, you can get away with good stuff at minimal prices. The main tourist attractions nearby are the Albuquerque mansion and the Chapora fort. Anjuna is also famous for its trance parties that take place on the shore. The music played is usually loud psychedelic trance, which transports one to another world literally. These parties usually take place on full moon nights as it adds to the magic of trance music. 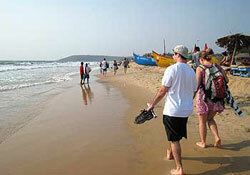 Getting to Anjuna Beach is not difficult as all forms of transport are available from the major cities. By Air : The nearest airport is at Dabolim, which is 29 km away from Panaji and 47 km from Anjuna. By Train :The nearest railway station is at Karmali 11 km away from Panaji and 29 km from Anjuna. By Bus :There are buses every hour to Anjuna from Mapusa (8 km). For tourists arriving from Mumbai, Mapusa is the jumping-off point for the northern beaches. There are frequent local buses to Panaji, which is just 18 km away. One can also hire a motorcycle or a taxi from Mapusa to reach Anjuna.